OptiCal Sciences offers effective, individual training solutions for your company. Each of our training programs can be tailored to suit the individual needs of your company, and may be conducted on-site or at our premises in either Northampton (UK) or Carlow (Ireland). 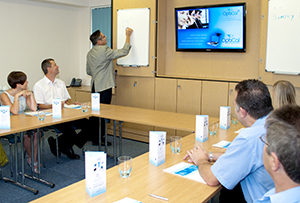 Training is professionally delivered using a combination of Microsoft PowerPoint presentations, hand-out material and practical demonstrations, where applicable. Upon completion of training, OptiCal Sciences' training certificates are issued to individual course attendees. The outcome of OptiCal Sciences' training for your Company would include self-assured operators, improved operator efficiency, minimized risk of flawed testing and error, reduced downtime, training records to assist with Medicines and Healthcare Regulatory Agency (MHRA), Food and Drug Administration (FDA), and Irish Medicines Board (IMB) compliance. Please contact us with your individual requirements and to schedule your training program today.